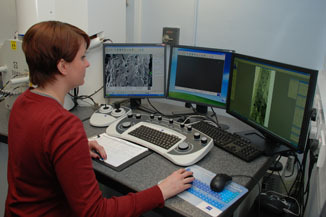 With its Gemini column and Smart SEM software interface, the Zeiss Sigma is a very easy to use variable pressure field emission scanning electron microscope (FESEM) yielding high resolution digital images. Switching between its four detectors, vacuum modes or changing the kV is achieved with minimal column adjustment. In variable pressure mode (1-133Pa) the Sigma chamber can accommodate the Gatan 3-view serial block face sectioning system.